Lithium-ion batteries have been behind a number of recent fires and meltdowns due to short-circuiting in mobile devices despite being extensively used in mobile devices from laptops to cell phones and are also considered to have one of the longest lifespans of commercial batteries today. In hope of preventing more of these hazardous malfunctions, researchers at Drexel University have produced a recipe capable of turning electrolyte solution, a main component of most batteries, into a safeguard against the chemical process that results in battery-related disasters. Drexel researchers have reported that adding nanodiamonds to the electrolyte solution in lithium batteries can prevent the formation of dendrites, the tendril-like deposits of ions that can grow inside a battery over time and cause hazardous malfunctions. (Photo courtesy of Drexel University and Tsinghua University). Yury Gogotsi, PhD, Distinguished University and Bach professor in the College of Engineering, and his team of researchers from the Department of Materials Science and Engineering, recently published their work — entitled “Nanodiamonds Suppress Growth of Lithium Dendrites” — in the journal Nature Communications. In this work, the team describes a process by which nanodiamonds — small diamond particles 10,000 times smaller than the diameter of a strand of hair — limit the electrochemical deposition, known as plating, capable of leading to dangerous short-circuiting of lithium ion batteries. With batteries being used and charged, the electrochemical reaction leads to the movement of ions between the two electrodes of a battery, which is considered to be the core of an electrical current. Overtime , this repositioning of ions will be able to develop tendril-like buildups — more or less like stalactites forming inside a cave. These battery buildups, known as dendrites, are considered to be one of the key causes that lead to lithium battery malfunction. As dendrites develop inside the battery over time, they can arrive at the inside the battery over time, they via the separator, a porous polymer film that has the potential to prevent the positively charged part of a battery from coming in touch with the negatively charged part. A short-circuit can occur when the separator is breached, and this can also lead to a fire since the electrolyte solution present in most lithium-ion batteries is highly flammable. Current battery designs include one electrode produced from graphite filled with lithium instead of pure lithium in order to minimize the probability of fire and avoid dendrite formation. The formation of dendrites is prevented by the use of graphite as the host for lithium. Lithium intercalated graphite is also known to store about 10 times less energy than pure lithium. 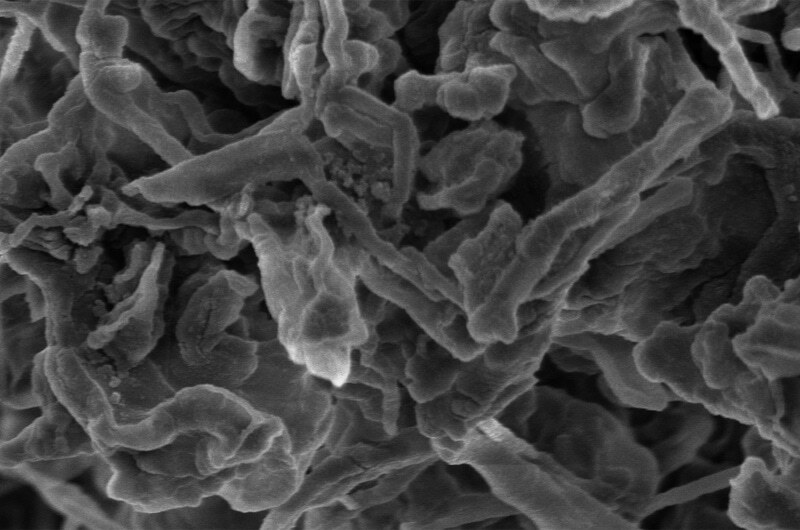 The breakthrough brought about by Gogotsi’s team explains the fact that a great increase in energy storage is possible since it is possible to eliminate dendrite formation in pure lithium electrodes. Battery safety is a key issue for this research. Small primary batteries in watches use lithium anodes, but they are only discharged once. When you start charging them again and again, dendrites start growing. There may be several safe cycles, but sooner or later a short-circuit will happen. We want to eliminate or, at least, minimize that possibility. Gogotsi and his collaborators from Tsinghua University in Beijing, and Hauzhong University of Science and Technology in Wuhan, China, focused their research on making lithium anodes in a manner that they are more stable and lithium plating more uniform so that dendrites do not grow. This is done by adding nanodiamonds to the electrolyte solution in a battery. Nanodiamonds have been employed in the electroplating industry for some time in order to make metal coatings more uniform. Nanodiamonds still preserve the regular structure and shape of their pricey progenitors despite being a lot smaller and cheaper than the diamonds found in a jeweler’s case. They naturally slide together to develop a smooth surface when they are deposited. The researchers discovered this property to be increasingly useful for eradicating dendrite formation. In the paper, they demonstrate that lithium ions can effortlessly get fixed to nanodiamonds, thus when they are plating the electrode they do so in the same systematic manner as the nanodiamond particles to which they are linked. In their report, the researchers explain that mixing nanodiamonds into the electrolyte solution of a lithium ion battery results in slowing dendrite formation to nil via 100 charge-discharge cycles. If it is assumed to be like a game of Tetris, that pile of mismatched blocks inching extremely close to “game over” is the equivalent of a dendrite. The addition of nanodiamonds to the mix is almost similar to the aspect of using a cheat code that slides each new block into the proper place in order to complete a line and prevent the formation of a menacing tower. Gogotsi points out that his group’s discovery is only the beginning of a process that could ultimately see electrolyte additives, such as nanodiamonds, being extensively used for producing safe lithium batteries with a high energy density. Initial results have already proved stable charge-discharge cycling for as long as 200 hours, which is considered to be long enough for use in some military or industrial applications, but not closely adequate for batteries used in cell phones or laptops. It is also necessary for researchers to test a large number of battery cells over a time period that adequately long enough under different physical conditions and temperatures in order to guarantee that dendrites will never grow. It’s potentially game-changing, but it is difficult to be 100 percent certain that dendrites will never grow. We anticipate the first use of our proposed technology will be in less critical applications — not in cell phones or car batteries. To ensure safety, additives to electrolytes, such as nanodiamonds, need to be combined with other precautions, such as using non-flammable electrolytes, safer electrode materials and stronger separators.